The Terani Couture pageant line is among the most glamorous of the Terani dress collections. Whether you’re searching for a special occasion dress or a pageant gown, you’ll find something extraordinary and unforgettable in Terani Couture’s pageant gowns line. Our pageant dresses line is created with a touch of elegance and the finest luxury materials. 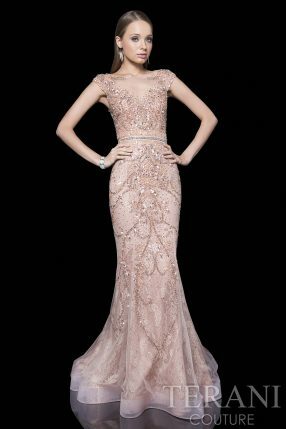 Each gown is unique, featuring dazzling rhinestones, jewels, delicate hand-beading, lace and feathers. 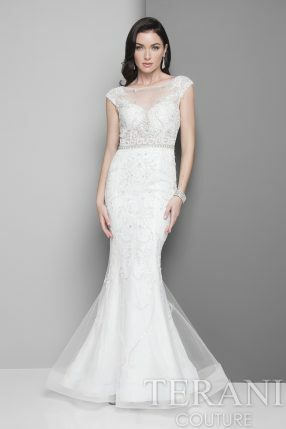 Off-shoulder necklines, beaded medallions and spaghetti straps are a few of the gown styles we offer, so you’ll find the perfect dress to showcase your true beauty. The magic of our dresses is in the details – delicate elements, craftsmanship and artistry shape each pageant gown’s flattering and memorable style. If you’re looking to dress to impress a crowd – or a panel of judges – look no further than Terani Couture. While fashion trends will come and go, a truly well-designed gown will look chic forever. Our dresses are designed to be timeliness – with elegant cuts and embellishments that will look chic today – and for years to come. Whether you’re a contestant in a local pageant, or on stage under the lights at the Miss America USA pageant, wearing a red carpet-worthy dress will have you looking your best. Of course, timeless style doesn’t have to mean buying off the rack. Work with the Terani dress design studio to create a custom gown for your pageant – one that helps you to shine brighter than the competition. Elegant lace is a trend that has been around for decades – but just because your grandma may have worn it, doesn’t mean it’s outdated. Lace is the ultimate in femininity – chic, refined and guaranteed to stun the crowds. See through sheaths, skinny straps that cross your back, or a bold, almost backless, low cut gown – we offer a wide variety of pageant gowns and daring styles to choose from for your next beauty pageant competition. Embellished bodices have been around for as long as we can remember. This is one classic trend that still has its desired impact on the crowds – it bedazzles! Custom Pageant dresses with embellished bodices come in a range of cuts, colors, and styles. 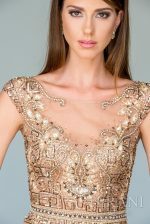 Whether encrusted with stones and jewels or brought alive with intricate pearl designs and an empire or basque waistline; embellished bodices never go wrong on a custom pageant dress. Choose from our wide variety of dresses you won’t be disappointed. If you’ve got gorgeous legs, we’ve got gowns to show them off. Beauty pageant dresses with high slits can make a big impact during the evening wear competition. Whether you opt for a front slit or a side one, a glimpse of the legs as you grace the pageant ramp will make sure you step your foot down and make your intentions clear – you’re in it to win it! Probably the most versatile dress type that you can pick for your showdown is the two-piece dress. With the style taking over the fashion world like a storm, it is undeniably making its way to the top of the charts as the most preferred dress style for beautiful girls in 2017. There’s so much you can do with a two-piece pageant dress, and experimenting with skirt styles is only the beginning! Whether you dream of becoming Miss United States, or simply winning the local race with your family in the crowd, make sure you’ve got the right dress! When you are competing at a high level it’s extremely important to find the perfect pageant dress. For a pageant look that will showcase your beauty, browse the unforgettable styles and collections created exclusively for you by Terani Couture.